“Novel and specific C9ORF72 antibodies are important reagents that allow for the further characterization of the protein’s endogenous function,” noted Brian Freibaum, St. Jude Children’s Research Hospital, Memphis, Tennessee. 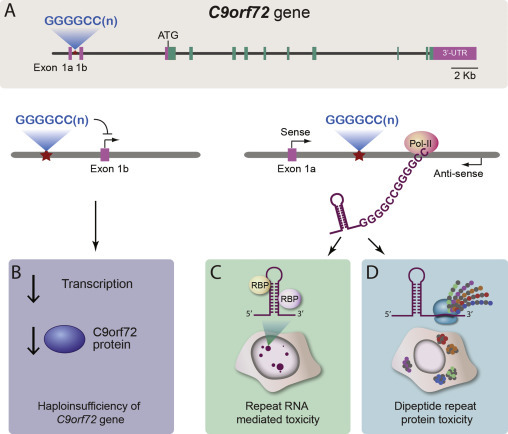 Multiple, nonexclusive hypotheses exist to explain how C9ORF72 expansions cause disease. These include two gain-of-function mechanisms, in which RNA transcribed from the expansions, or the dipeptide repeats translated from that RNA, form toxic aggregates that sequester other RNAs and proteins. Some evidence also supports the idea that loss of C9ORF72 function could play a role, since the repeat expansions reportedly hobble transcription of the gene (see Feb 2018 news; Waite et al., 2014; van Blitterswijk et al., 2015). However, the physiological function of the wild-type C9ORF72 remains a mystery, and detecting it has been hampered by a lack of specific monoclonal antibodies. Neumann told Alzforum that commercially available antibodies only detect the protein when it is highly overexpressed, rendering efforts to measure physiological levels futile. She added that compared with other proteins, C9ORF72 happens to have very low antigenicity, presenting a high hurdle for antibody development. The cerebellum data contradicts some previous reports, which found no reduction in protein levels in the region in expansion carriers, despite less mRNA there, even as the protein plummeted in the cortex (see Aug 2015 news; Waite et al., 2014). The researchers attributed these differences to the higher sensitivity of their antibodies, claiming that the drop in C9ORF72 protein levels in degenerating regions of the brain may have been easier to pick up with less sensitive antibodies. Neumann is currently sharing the new antibodies with interested collaborators, and told Alzforum she has initiated the process of making them available commercially as well. Gitler AD, Tsuiji H. There has been an awakening: Emerging mechanisms of C9orf72 mutations in FTD/ALS. Brain Res. 2016 Sep 15;1647:19-29. PubMed. Zhang Y, Burberry A, Wang JY, Sandoe J, Ghosh S, Udeshi ND, Svinkina T, Mordes DA, Mok J, Charlton M, Li QZ, Carr SA, Eggan K. The C9orf72-interacting protein Smcr8 is a negative regulator of autoimmunity and lysosomal exocytosis. Genes Dev. 2018 Jul 1;32(13-14):929-943. PubMed. Shi Y, Lin S, Staats KA, Li Y, Chang WH, Hung ST, Hendricks E, Linares GR, Wang Y, Son EY, Wen X, Kisler K, Wilkinson B, Menendez L, Sugawara T, Woolwine P, Huang M, Cowan MJ, Ge B, Koutsodendris N, Sandor KP, Komberg J, Vangoor VR, Senthilkumar K, Hennes V, Seah C, Nelson AR, Cheng TY, Lee SJ, August PR, Chen JA, Wisniewski N, Hanson-Smith V, Belgard TG, Zhang A, Coba M, Grunseich C, Ward ME, van den Berg LH, Pasterkamp RJ, Trotti D, Zlokovic BV, Ichida JK. Haploinsufficiency leads to neurodegeneration in C9ORF72 ALS/FTD human induced motor neurons. Nat Med. 2018 Mar;24(3):313-325. PubMed. O’Rourke JG, Bogdanik L, Yáñez A, Lall D, Wolf AJ, Muhammad AK, Ho R, Carmona S, Vit JP, Zarrow J, Kim KJ, Bell S, Harms MB, Miller TM, Dangler CA, Underhill DM, Goodridge HS, Lutz CM, Baloh RH. 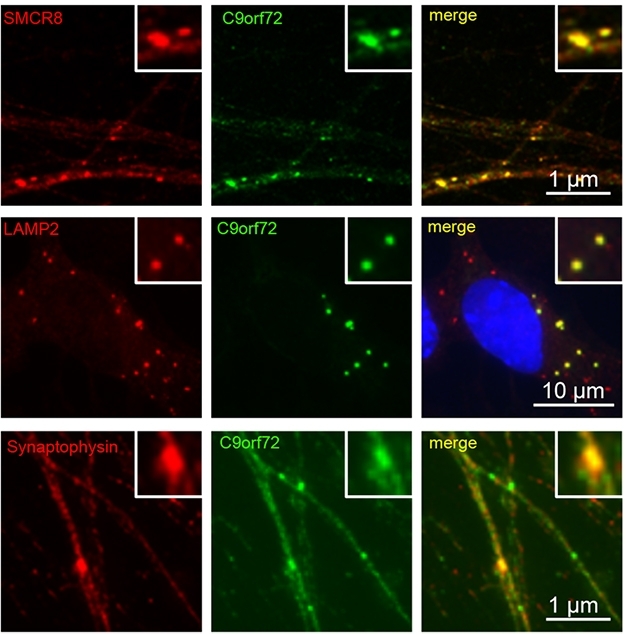 C9orf72 is required for proper macrophage and microglial function in mice. Science. 2016 Mar 18;351(6279):1324-9. PubMed.